arps is the first album by Raleigh-based John Mitchell, aka midcentury modular. His work has been influenced by some of the known acts from the modular world, mostly: Matthias Puech with his A Year Of Time and Emily Sprague’s Water Memory. Still, he has his own voice and focus when it comes to composition and process. There’s a reason I’m mentioning his influences right at the beginning, though I’m sure you’ve already spotted the pattern. For some time I have been looking with great interest at the vibrant community forming around what I’d loosely call “modular ambient”. This of course informs my choices when it comes to these Chosen Waves articles, but I also like how they form a bigger story. 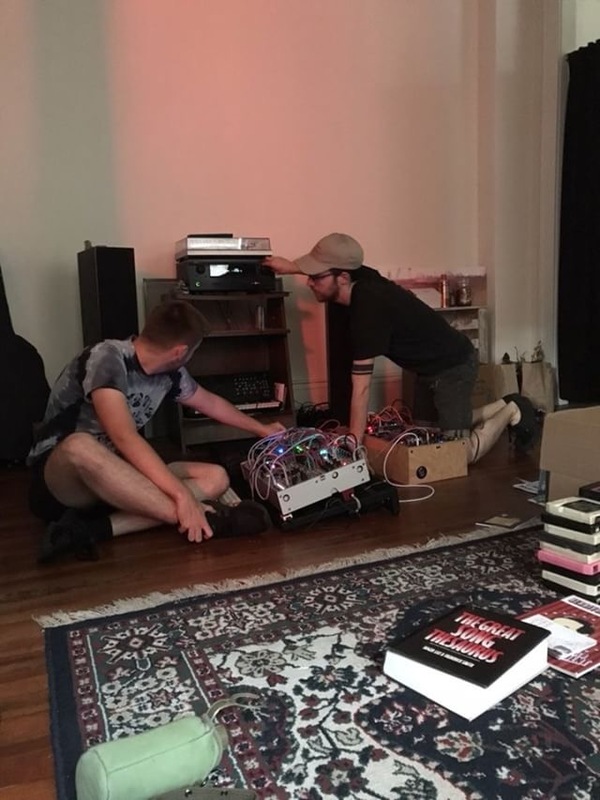 They are a picture of what is currently going on in the modular community, or at least a part of it. I should note though, that it will always be a bit of a partial picture; a fragment. Some voices are missing. Interesting – maybe even fundamental – works and acts are not present. But I see Horizontalpitch as being just one part of a bigger puzzle, which you have to solve yourself. When John’s tape came out some time ago, I knew that he was part of this bigger story. So here comes this new chosen wave: arp of contemplation! John Mitchell: When I was a kid, I did piano, and later, guitar lessons, though I was never very intensely focused and disciplined about it. I started spending more time doing music stuff in college. I was a DJ and helped curate the music selection for my college radio station. I ran sound at live events the station put on and started to do some recording stuff for friends’ bands with a pretty minimal/DIY setup. I also started playing guitar in a shoegaze-y band that would play around town called Less Western. HP: What’s your story with the modular? How did you first find out about it? When did you realize that you wanted to use one in your music? JM: While in college, I took a course on computer music composition, that also acted as a historical survey of academic electronic music. That was my first exposure to some early computer music composers and the machines they were using, as well as the first time I had started to get into the technical details of various synthesis techniques in terms of my own creations. Between that, messing around with the Ableton synths, and an interest and growing collection of guitar pedals, I discovered modular synths through online forums. The first modular softsynth I tried was BEAP, which is a set of modules that you can patch in Max. The first Moogfest in Durham (where I lived), that happened in 2016, was the first time I got to use hardware synth modules. At that point, I had read a lot about various modules and formats, and trying things out (and finding myself continually going back over the weekend to the marketplace, excited to try more things out) made me decide it was something I was ready to jump into. I started my first system with a couple of modules (the Mutable Instruments Elements and Peaks). Since then, I have built up my system to 7u/84hp—where I’m trying to stay! I’ve also picked up some soldering skills to build a few kits, played some shows, helped develop a website for a module maker (which is how I met you! ), did some open source contributions to the HTML documentation and C++ codebase of the Monome Teletype and released this cassette with some of my recordings with the modular. John and Ross Gongaware performing at a house venue called “Diner 105”. Photo by John Kovalchik. HP: What does “playing a modular” mean to you? JM: In terms of recording, I’ve explored different integrations between the hardware system and the computer (such as MIDI and CV control through a DC-coupled audio interface), but I think I most like treating the computer as a polisher/combiner/cataloger of ideas that are more or less one-offs from the hardware. I’ll build up a patch from a sound or technique I’m interested in experimenting with and record a take of that in the same session. Conceptually, I love the concept of a modular system as an orchestra, with multiple voices that can be controlled and manipulated in various ways (Kaitlyn Aurelia Smith, whose music is a huge inspiration to me, introduced me to this concept in this video). HP: I guess arps was created more or less following this approach, wasn’t it? Can you tell me a bit more about your process for this album? JM: Yep! arps has recordings that range from a few months after starting my system to somewhat recent and has a bit of all these phases of my process. I try to be good about recording everything and organizing it (with playable bounces) in Splice so that I can reference them whenever I’m inspired to. I treat recordings, which are typically summed, stereo bounces, a bit like raw resources waiting to be spliced together, overdubbed and referenced next to each other to build out a larger idea. I had been reading and reflecting on people’s ideas they had shared on this great thread on lines called Executing the modular album, when I decided one day, while at a coffee shop, that I was going to go through my recordings and find some things that felt like they flowed together. I decided the track order pretty impulsively and quickly, right then. The spectrums ended up getting swapped eventually, but otherwise this stayed intact. A few days later, I listened to a quick mix of the raw versions of these tracks while exercising on the elliptical which is when I figured out how I wanted to bring it together into something cohesive aesthetically. I completed that process over the next few weeks – taking the bounces of the tracks and running them through various processors, to make everything more full and in a drenched and dense space. The idea of “songs”, in terms of iteration on singular and defined musical ideas, is a pretty recent path I’ve been exploring, and I would say it’s pretty non-existent in the arps creative timeframe. HP: Regarding your recording process, when do the pedals come into play? You make quite a heavy use of them, and I’d argue that they make up a consistent part of you sound. Do you always run everything through them? Or do you leave that for the second phase of the process? JM: One tricky thing with some pedals is that they can lack head room. Gain staging can mean a lot of attenuating and boosting as you go in and out from pedals to modular. Because of this, I do tend towards running pedals end of chain, post-modular (especially more so now that everything is on the board). In the current iteration of the system I run things through the effects in the same phase. On arps, I explored sending and returning with my audio interface and Ableton so that I could have more fine grain control, but I’ve found that fixing the latency and setting up the routing for this kind of thing is pretty cumbersome and the troubleshooting required can be a bit of a creative hindrance. I may explore a more traditional mixer setup, with the effects on send/return at some point. With arps, I was pretty heavy handed with reverb, delay and saturation/overdrive. The creative process for many of the tracks was like I was trying to build up a full environment for a small amount of voices to live in, rather than juggle a lot of complex, primary melodic voices and lines. The processing and effects sit forward in the mix and become a big part of the overall sound because of it. HP: Did you ever want to replace all your pedals with fx modules? JM: I do think there would be some usability advantages to an all-module setup – being able to have everything in a single case would be an improvement over my current pedalboard-based setup, which I really enjoy because it is contained and portable, though it is still somewhat cumbersome and heavy. I feel like there aren’t a lot of great module alternatives to the pedals I currently use in my setup (Meris Polymoon and Mercury7, Boss RE-20 Space Echo, and Elektron Analog Heat). The designs are either mono – I really prefer to work with effects in stereo as it helps to build up the space, too wide for the size/capability I’m trying to keep things at, or not a lot of interesting parameters to tweak/modulate. HP: how did you choose the track names on arps? What do they mean? JM: I came up with the concept of the “arp of” prefix around the time I was compiling the things I wanted in the release. The specific names for particular tracks are varied – some are attempts at describing the sound I was going for, some are about things that were going on in my life when they were recorded. I’m not the most deliberate or intentional when it comes to names, I usually settle on the first idea that feels close-ish. HP: Will you be playing some of arps live as well? Or have you done that already? If you are, how do you go from something that is aimed at being a recording to something you can play live? JM: I haven’t played the particular songs out before, and I’m bad about persisting teletype patches and other sequencing data. 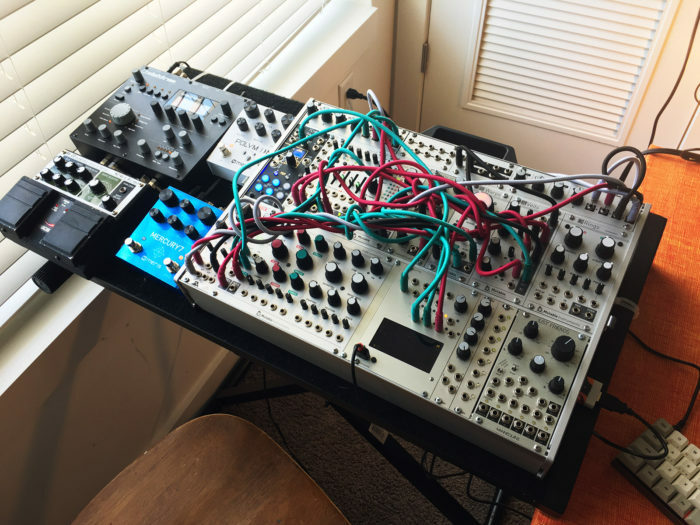 I like the idea I learned at one of Emily Sprague’s workshops at Moogfest this past year: Of modular patches existing in a particular place and time. That beings said, I’d definitely be happy to explore some of the concepts, voice architecture and overall vibes again. HP: To close this interview, what is coming next from Midcentury Modular? Upcoming projects? JM: Sure! The next project is going to be a record called drones. Compared to arps, it is a bit less lo-fi and a bit more ranging across the frequency spectrum. It’s all synthesized sounds from the eurorack/pedal system, most of the tracks being combinations of 2 or 3 patches mixed on top of each other. I am finishing up the mixes and starting the process of getting the album art, layout and physical production finished. I’ve also got a collaborative video project in the works for one of the tracks on drones. I’m super excited to see what comes of that!